Have you seen the Office of Disease Prevention and Health Promotion recently released physical activity guidelines? The guidelines provide evidence-based guidance to help Americans maintain or improve their health through exercise. Updated research shows additional benefits of improved brain health, reduced cancer risk, and reduced falls risk. Exercise helps to improve function, sleep habits, and mood. Exercise is appropriate for all ages, even those with chronic health issues or pain. And most recently it has been determined that it doesn’t matter how much exercise you do in one setting. You could exercise for 5 minute increments or less by climbing an extra flight of stairs, parking farther away from the store and walking, or performing exercises at your desk at work. All you need is to increase your heart rate to receive the benefits! And the benefits are astounding! For substantial health benefits adults should exercise at least 150 min or 2.5 hours per week at a moderate intensity. 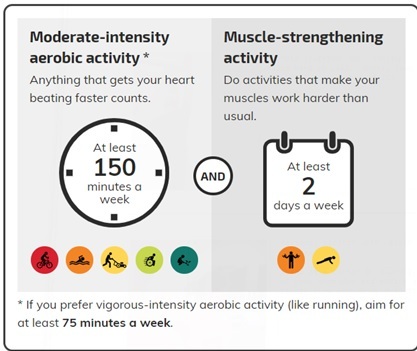 Examples of moderate intensity exercise include a brisk walk, playing doubles tennis, general yard work, water aerobics, swimming, yoga, and ballroom dancing. In addition to aerobic exercise, it’s important to participate in strength training two days weekly. Strength training should include all major muscle groups. Additionally, the guidelines suggest participating in flexibility and balance exercises. The guidelines may seem overwhelming to someone who has never participated in regular exercise. And that’s why we are here to help! As physical therapists, we spend every day developing safe and manageable exercise programs for clients of all ages, medical backgrounds, and levels of fitness. Each and every day we help clients take the first steps towards achieving the goals that the Physical Activity Guidelines suggest. We understand that if you’ve never been a regular exerciser, exercise programs are intimidating and overwhelming. But when you look at the astounding health benefits you can receive through exercise—taking the first step is important.